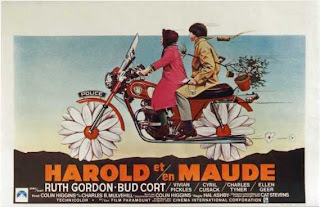 I watched Harold and Maude last night. Oh my, what an utterly dreadful movie! It's such a depressing film. I know that movies from the Seventies have a tendency to be morbid or pessimistic, but I think that film is one of the worst cased of it I've ever seen. Really? I thought it was a cute story. It was a terrible story! Okay, the basic plot is okay--"misunderstood teenager meets eccentric, carefree elderly spirit." But then they...they ruin it! Hal Ashby should have been scolded for that. I don't think they ruined it at all! Why do you say that? I like the premise of the kid learning about life from an elder--that's a classic story. It reminded me of Kristin Hersh's book Rat Girl, to be honest. But as the movie goes along, nothing really happens. What does the kid learn? He hears stories, but he doesn't really change. He keeps acting the way he acted before he met her. To me it seems like an allegory about never losing your spirit as you get older. After all, she's a happy lady, enjoying life, even though she's at the end of her life. Well, to me, it seems like an allegory that never reveals itself! What does it say, "follow your cares and dreams?" The way it works to me, here's a kid starved for attention from his wealthy mother and his family, not understood by his elders. He meets an elderly woman as he participates in his favorite hobby, going to other people's funerals. He becomes entranced with her. His mother tries to set him up with girls. He's not interested. He declares his love for Maude, he asks her to marry him. And what does she do? Commits suicide! That's a horrible thing! Then he drives his expensive sports car that he converted into a hearse off of a cliff! And as you're sitting there thinking this is one of the most horrible things ever, you see him, dancing off, playing a banjo! I watched that and thought, "What was the point?" Honestly, I can't see one. I thought the mother was a creep, honestly. And how old was Harold, anyway? At the first, he looks like he's nine or ten. Then he looks like he's 15, 16 tops. And the mother's bringing home all these women in their twenties? And what does the kid do? It reminds me of the one thing I dislike about films and stories that are about the "free-spirited" types--it's really easy to be that way when you don't have to worry about rent or food or necessities. This kid is the idle rich, and while I'm not saying the feelings of the wealthy are invalid, I just dislike how movies and books and TV glorify these ideas of "carpe diem" to people who just need to be more practical. I can see that; I kept thinking that Sunshine would be his salvation. I was hoping that he would fall for her, and that he'd...grow up. I did, too! And that's another reason I disliked the story. Here's a girl who doesn't cower when he reveals his creepy behavior--heck, it's just the opposite--she likes him for it and encourages it, and bests him at it! I thought I saw a little bit of a spark in his eyes about her, but what does he do? He goes and proposes to Maude! And then, she acts accepting of it, and then commits suicide! I think the movie isn't flawed in that he developed feelings for her. I can see that. I think that would have been a legitimate development; but they didn't do that, and I think they lost a great opportunity. Instead, they just made that weird kid seem even weirder. And that final scene? Dancing off into the sunset playing a Cat Stevens song on a random banjo? What? I'm sorry, but, ew. What would you have done to improve it? Well, I would have had her sit down and explain to him that she is an old woman, that a young woman has affection for him, and that he should explore it, and have the film go from there. Maybe that's boring of me. Maybe that's not a very fun way to conclude things. But it would have been more realistic, and it would have been a nice coming of age film that way. 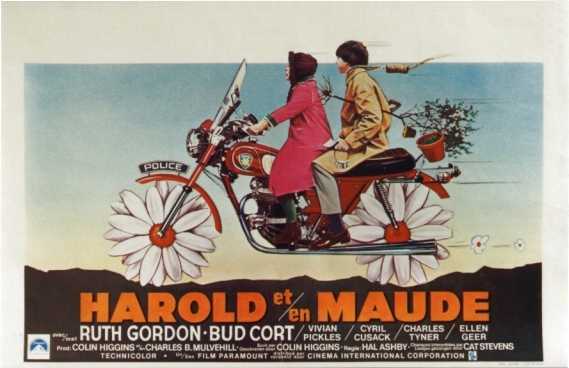 Instead, it went for the hippy-dippy ending; the kid seemingly 'rejecting' his materialism in a grand scheme that played with the emotions of the viewer in a really cheap way. I have to say, though, I probably would have loved this film 20 years ago. So maybe it's an age thing. I will concede that. I just think that the story arc I mentioned earlier would have been better, a more universal picture.